Guar gum is major export farm commodity from India. It is produced after processing of Gaur seed. India produces more than 85 % Guar Seed of the world. Normally there is 27% - 30% recovery of guar gum split from Guar seed. Guar Gum splits are further processed into guar gum powder. 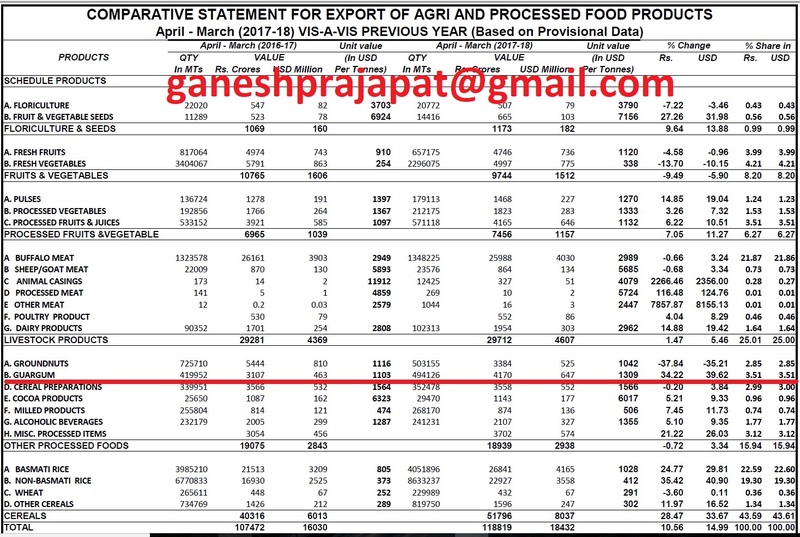 If we analyze the data of guar seed export of last eight years. In the Year 2017-18, there was the export of 4,49,126 MT of guar gum. Guar gum export It is increasing continuously since last three years. This year there was fourth highest export in last eight years. Most of Guar gum powder is used is oil and Natural Gas industry as drilling chemical/ ingredient. Oil prices are continuously recovering from last fiscal year. Currently, prices of crude oil are maintaining its level above USD 70 /barrel. That is good for Indian Guar gum industry as this level will attract more investment to oil exploration sector. Drilling activities are regularly increasing in USA. The demand for Guar gum will increase with increasing drilling activities in the USA. USA is the major destination for Indian Gaur Gum powder. As per primary data released by APEDA, 494126 MT of Guar gum was exported during last fiscal year from April-2017 to March-2018. Value of exported guar gum is 647 Million USD or 4170 Crore Indian Rupees. Guar gum is major farm export commodity form India. During the last fiscal year, there was the export of 419952 MT of Guar gum during the period from April 2016 to March 2017. Value of exported Guar gum for the period from April 2016 to March 2017 was 463 Million USD or 3107 Crore Indian Rupees. 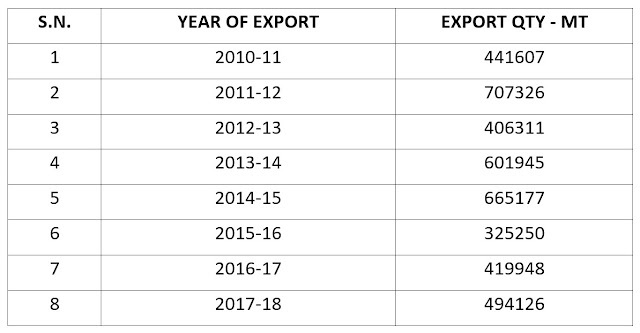 This year (2017-2018) there is an increase of 74,174 MT in the export quantity of Guar gum in comparison to last year (20016-2017) or 17 % increase in export quantity. This year (2017-2018) there is the increase of 184 Million in the value of exported Guar gum in comparison to last year (20016-2017) or 39 % increase in export value in USD. In Indian rupees this year (2017-2018) there is the increase of 1063 Crore rupees in the value of exported Guar gum in comparison to last year (20016-2017) or 34 % increase in export value in Indian rupees. This year (2017-2018) there is the increase of 206 USD/MT in the rate of exported Guar gum in comparison to last year (20016-2017) or 18.63 % increase in the rate of exported Guar gum (USD/MT). During the month March– 2018 there was an export of 44,417 MT of Guar gum. Value of exported Guar gum during March-18 is 50 Million USD or 457 Crore Indian Rupees. During month March 2018 Guar gum was exported at the rate of 1575 USD/MT or approximately INR100/Kg. During February-2018 Guar gum was exported at the rate of 1497 USD/MT or approximately INR 95/Kg. Data are very positive for rest of period of the current budget year. After the analysis, it was found that all the figures are positive. If the exports, go on at the current rate then there will export of 3,20,000 MT Guar gum in next 8 Months. There will further requirement of around 11,00,000 MT of Guar seed for export purpose. There will also the requirement of 20,000 MT for Guar seed sowing purpose. There will be total requirement of 13,00,000 MT of Guar seed up to the arrival of the New crop. As per one estimate, 6,00,000 MT Guar seed has been after arrival from the new crop. In the current Guar seed production cycle (November-17- October-18) there is the tentative demand of 20,00,000 of MT of Guar seed as per market men there was the production of 9,00,000 MT of Guar seed in the current production cycle. The shortfall is expected to complete with carryover stock. But the supply of Guar seed will be remaining very tight for rest of period. Crude oil prices are increasing, and demand for guar gum powder is expected to increase. If the demand for guar gum powder will increase, then the gap between supply and demand will increase further. Guar is major drilling chemical used in fracking technology for crude oil exploration from the shale formation. The USA is producing more crude oil to increase its global market share in crude oil export. Is this right time to invest in " Guar gum industry " ?? Guar is an arid crop grown in western part of India. Botanically Guar is known as Cyamopsis tetragonoloba. The western part of India is arid area and rainfall in this area is also very low. Guar crop is grown here for centuries. Guar seed is processed into Guar gum powder, which is used in many industries. In Portuguese guar gum is known as "Goma De Guar" in Spanish it is known as "Goma de Guar". In German it is known as "Guarkernmehl". In French, it is Known as " La gommede guar ". In Russian it is known as "Гуаровая камедь". In greek it is known as " κόμμιγκουάρ ". In Swedish it is known as " Guargummi ". In Chinese It is known as "瓜爾豆膠 " In Italian it is known as "Gomma di Guar". In polish it is known as "Guma guar". Guar is an annual legume crop. Guar is cultivated in low water condition, Guar requires well drainage soils for good root development. 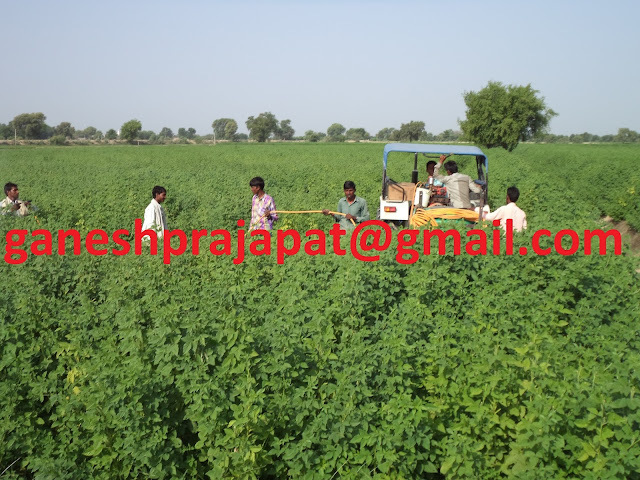 Guar is a nitrogen fixation crop and it is used as green manure. 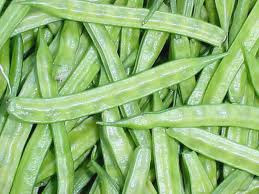 Green pods of Guar is used for the vegetable purpose like other beans. Guar plant is good fodder for cattle. Cooked Guar seed is used as concentrated feed for milking cattle's. By-product of guar seed processing is known as Guar meal, Guar korma. There is 50-56% protein in Guar Korma. Guar gum seed is an industrial crop. Guar seed is processed into guar gum split and guar gum splits are further processed into Guar gum powder. Guar gum powder is used in various industries. Guar gum has various food applications. Guar gum is used as viscosity agent. Guar gum is also used as a stabilizer. Guar gum is widely used in sauces, ketchup, juices, ice cream, biscuits, Gluten-free cooking and many more. Guar gum is used in the printing industry as moisture retention in Ink. Guar gum is used in paper industry. Guar gum is used in textile industry. Guar gum is also used in cosmetic items, shampoo, moisturizers, liquid shop, lipsticks and many more. Guar gum is also used in pharmaceuticals industry as the binding agent, viscosity agent. Guar gum is also used as dietary fibers. Guar gum used in fish and meat industry. The major application of guar gum is in oil and natural gas industry. Guar gum is used as drilling chemical in Oil and Natural Gas Industry. Around 60 % demand of Guar gum arises from oil and Natural Gas Industry. 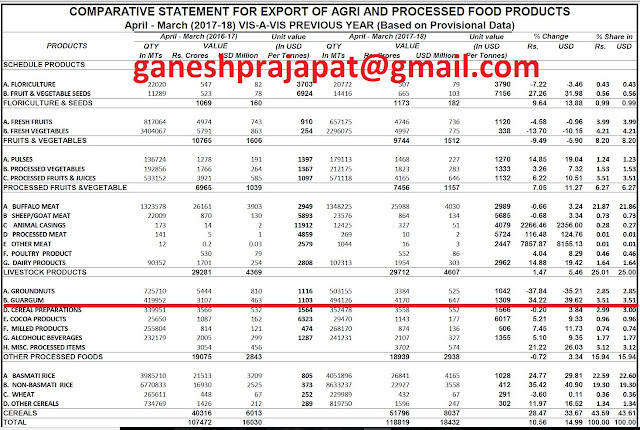 APEDA has released the export data of Gar gum up to February-2018. As per export data released by APEDA, the value of export of Guar gum has increased by 45.5 %. 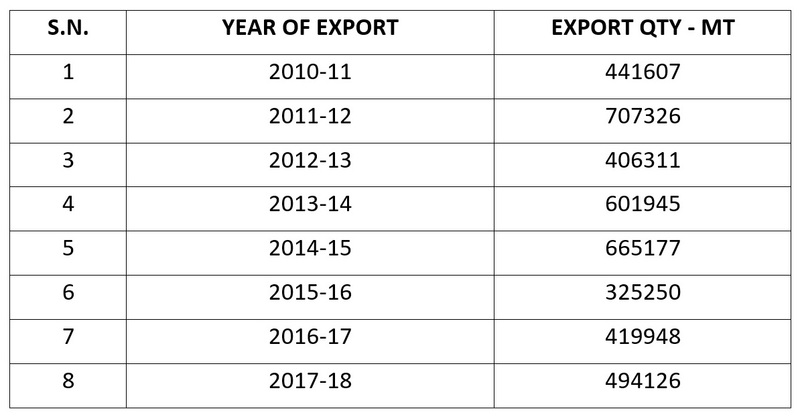 As per new data during last budget year, export of Guar gum from April-2017 to February-2018 was 4,49,709 MT. During last year for the same period from April- 2016 to the February- 2017 export of Guar gum was 3,61,833 MT only. There is an increase of 87,873 MT or 24.28 % in quantity of Guar gum products for the same period from April-2016 - to February-2017. Last year from April-2016 to February-2017, India exported Guar gum, values of INR 2666,00,00,000 (2666 crore) or 396 Million USD, for the same period during this year from April-2017 to February-2018 India exported Guar gum value of INR 3713,00,00,000 (3713 Crore) or 577 Million USD. Last year from April-2016 to the February-2017-unit value of Guar gum export was 1096 USD/MT this year for the same period from April-2017 to the February-2018-unit value of Guar gum export is 1282 USD/MT. In Indian rupees, there is an increase of 39.3% INR and in USD it is an increase of 45.5% in value of export of guar gum. Only in the January-2018 month, there was an export of 44,080 MT of Guar gum. 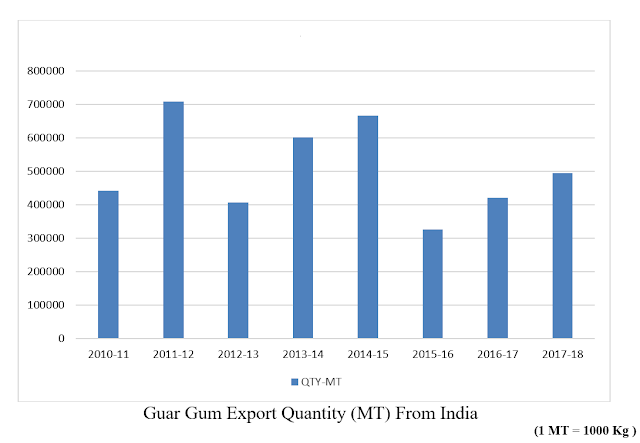 Export of Guar gum is increasing slowly and slowly. Crude prices are increasing regularly. The demand for Guar gum will increase with increasing crude oil price. Crude oil production will increase in the USA through the hydraulic fracking process. Guar seed and guar gum prices are in recovery trend. Today Guar seed and guar gum closed in the upward trend. There is the improvement in the export of guar gum. Guar seed and guar gum prices have shown some recovery today after falling from the level of 4800/100Kg and 9800/100 Kg. It is necessary that this trend must be continuous for rest of week for Guar seed and guar gum prices. Stability of Guar seed above 4000/100g level is very positive fundamental for Guar seed and guar gum prices. Geopolitical situations are taking crude oil in the upward direction. Crude oil is sustaining above the level of USD 70/barrel. As per expert, it may reach to USD 75/barrel. The USA will continue its drilling activities with increasing crude oil prices. The demand for Guar will increase with the increasing crude oil prices. 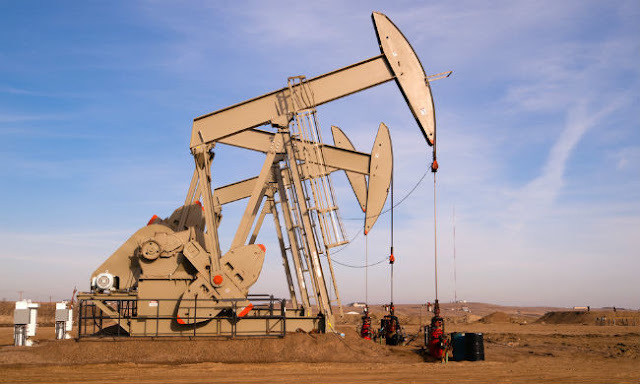 The trade war between USA and China will also put an impact on global crude oil prices. Crude has crossed the level of USD71/barrel. As per local market conditions are concerned local arrival of Guar seed has dropped. The arrival of Rabi crop has started. Traders and farmers are busy in selling and trading of Rabi commodity. After the new budget year, there is some sign of improvement in Guar seed and guar gum prices. There is news of rainfall in Guar seed growing belt, off-season rainfall may cause the loss to harvested Rabi crop. Guar churi and guar korma prices are giving good support to Guar seed prices at the lower side. China has put the extra duty on Soybean import from the USA. The demand for Guar Churi and guar korma may rise from China in coming days as Guar Churi and guar korma guar is the major substitute of Soya protein as animal feed protein. Guar seed and guar gum prices are being traded strong physical markets. Guar seed and guar gum prices are quoted higher than NCDEX prices. Future trading of Guar seed and guar gum prices is also expected to be strong with increasing export demand. The superior quality of guar seed is being traded at Rs 4300/100Kg and average quality guar seed is traded at Rs 4200/100 Kg. Standard quality guar gum is traded at Rs 8900/100 kg. In interior location, guar is traded up to 4000/100 Kg. guar seed was closed strong in the future market. At NCDEX (National Commodity & Derivatives Exchange Ltd) guar seed-10MT is being traded at Rs 4150, 4170, 4215 higher by 2.34 percent or INR 95/100 Kg, 2.09 percent or INR 85.5/100 Kg, 2.32 percent or INR 95.5/100 Kg with open interest of 12640, 133740, 17340 for April, May and Jun month contracts. 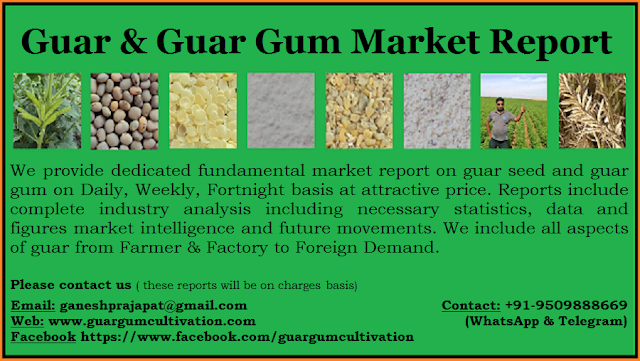 Guar gum was also closed strong in the future market. At NCDEX (National Commodity & Derivatives Exchange Ltd) Guar gum- 5MT is being traded at Rs 8847, 9010, 9123 higher by 1.34 percent or Rs 117/100Kg, 1.61 percent or Rs 143/100, 2.66 percent or Rs 263/100 with an open interest of 1460, 58840, 3645 for April, May and June months contract. For the current Guar crop cultivation cycle of six months have passed. New guar crop will come after 7-8 months. Price of guar seed is still moving around 4000. It is the good sign that prices of guar seed have not dropped below 4000 level. Last budget year was good for Guar. The new budget year has started. Business activity related to guar seed and guar gum will start for the new fiscal year in April month. During last two months, Guar seed prices have dropped from its highest level of 4800/100Kg at NCDEX. Guar seed is being sold at the higher price in the physical market than the NCDEX. As per market information pressure of speculators will come down in coming days as the demand of guar seed is expected to increase in the market. The arrival of guar seed has almost dropped in the physical market. The numbers of oil rigs are also increasing in the USA. With existing increasing political & military dispute with Russia and increasing trade war trade war with China, Crude prices are expected rise further. The USA would like to increase its market share in global crude oil export by increasing crude oil production. USA would explore its crude oil resources at full capacity so that it can increase the supply to EUROPE to decrease the dependence of Europe on Russian crude oil. Guar gum demand will increase with increasing crude oil production USA. As per available information this year there was production 8-9 Million Bags of guar seed in India. This much quantity is not sufficient to fulfil the annul demand of guar seed. It is not time to sell the guar seed commodity farmers can wait for next 3-4 Months. Guar seed and guar gum prices are strong in the local physical markets. 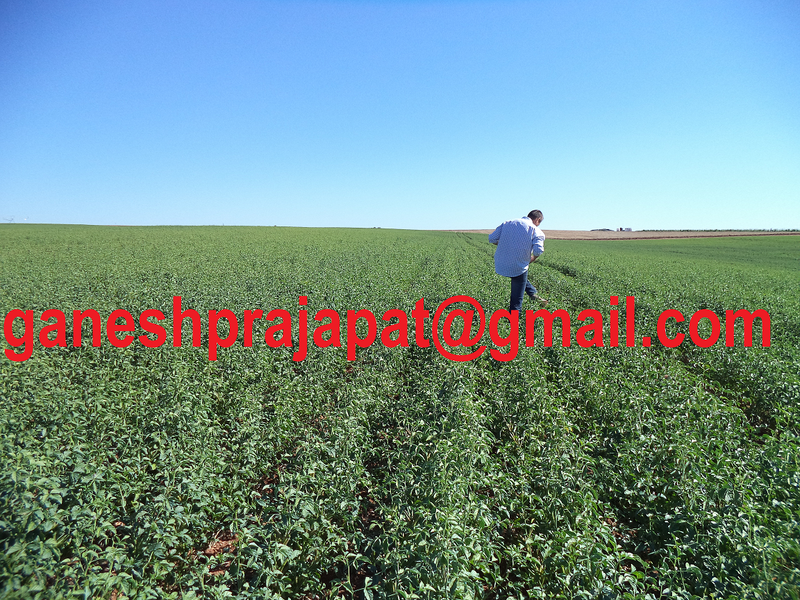 Prices of guar seed and guar gum are quoted higher than Commodity exchanges. Future trading of guar and guar gum is also expected to be strong with increasing export demand. Good quality of guar seed is traded at Rs 4300/100Kg and average quality guar seed is traded at Rs 4100/100 Kg. Standard quality guar gum is traded at Rs 8900/100 kg. In interior location, guar is traded up to 4000/100 Kg. guar seed is being traded strongly in the future market. At NCDEX (National Commodity & Derivatives Exchange Ltd) guar seed-10MT is being traded at Rs 4098, 4125, 4164 higher by 0.34 percent or INR 14/100 Kg, 0.28 percent or INR 11.5/100 Kg, 0.19 percent or INR 8/100 Kg with open interest of 40140, 102620, 7950 for April May and Jun month contracts. Guar gum is being also traded upward in the future market. At NCDEX (National Commodity & Derivatives Exchange Ltd) Guar gum- 5MT is being traded at Rs 8788, 8901, 8980 higher by 0.38 percent or Rs 33/100Kg, 0.15 percent or Rs 45/100, 0.26 percent or Rs 23/100 with an open interest of 17010, 48195, 790 for April, May and June months contract. Guar is an arid crop grown in western part of India. Botanically it is known as Cyamopsis tetragonoloba. The western part of India is arid area and rainfall in this area is also very low. Guar crop is grown here for centuries. Guar seed is processed into Guar gum powder, which is used in many industries. In Portuguese guar gum is known as "Goma De Guar" in Spanish it is known as "Goma de Guar". In German it is known as "Guarkernmehl". In French, it is Known as "La gommede guar". In Russian it is known as "Гуаровая камедь". In greek it is known as " κόμμιγκουάρ ". In Swedish it is known as " Guargummi ". In Chinese It is known as "瓜爾豆膠 " In Italian it is known as "Gomma di Guar". In polish it is known as "Guma guar". Guar is an annual legume crop. It is cultivated in low water condition, It requires well drainage soils for good root development. Guar is a nitrogen fixation crop and it is used as green manure. 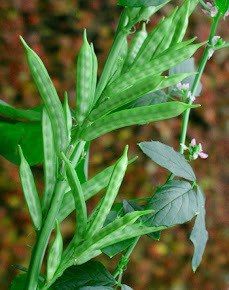 Green pods of Guar is used for the vegetable purpose like other beans. Guar plant is good fodder for cattle. Cooked Guar seed is used as concentrated feed for milking cattle's. By-product of guar seed processing is known as Guar meal, Guar korma. There is 50-56% protein in Guar Korma. 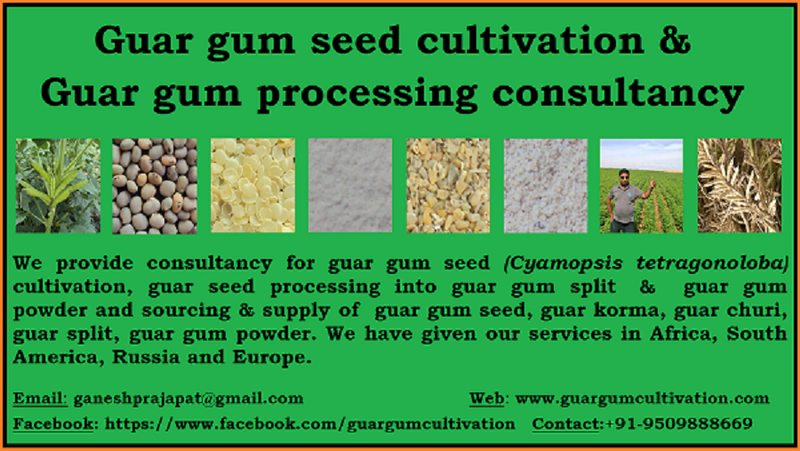 Guar gum seed is an industrial crop. 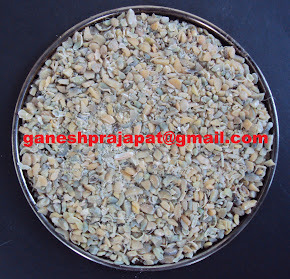 Guar seed is processed into guar split and guar splits are further processed into Guar gum powder. Guar gum powder is used in various industries. Guar gum has various food applications. Guar gum is used as viscosity agent. Guar gum is also used as a stabilizer. Guar gum is widely used in sauces, ketchup, juices, ice cream, biscuits, Gluten-free cooking and many more. Guar gum is used in the printing industry as moisture retention in Ink. Guar gum is used in paper industry. Guar gum is used in textile industry. Prediction of normal rainfall and Guar price movement. The primary prediction has come for normal rainfall in India. It is expected that rainfall will be normal this year. Farmers will go for the pulses cultivation. As pulses will be supported by the MSP so farmers will go for the pulses cultivation instead of Guar. Crude oil prices are keep improving. And it trying to stable above USD70/BarrelThe demanded of guar gum powder will increase with increased oil exploration activities the in USA. 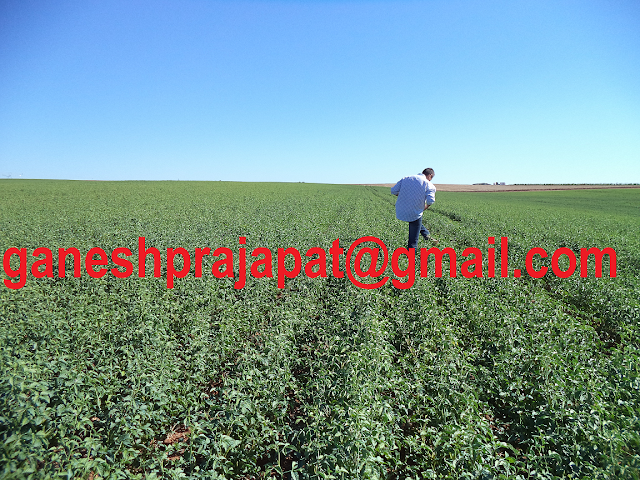 There is 7 months to come to the Fresh crop of Guar in the market. Up to that time, existing stock will be processed to full fill the demand. As per market information stock of guar seed is limited for this year. Export of gaur is expected to remain higher than the previous year. All the factors are positive for upward guar prices. After two months sowing of Guar will start and there will be he requirement of Guar seed for sowing purpose. Supply is already tight in the market.